As teenagers get their driver’s licenses and hit the road, parents usually decide what their children drive, and most feel comfortable with a vehicle that’s as safe as can possibly be. A lot of times that choice is a pick-up truck because it's large, and seemingly indestructible. Parents and teen drivers, however, take note: a pick-up truck could be the most dangerous vehicle for a 16-17 year old to drive. 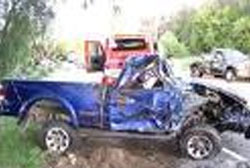 According to a recent study conducted by the University of Texas and published in the traffic safety journal Accident Analysis and Prevention, teens driving pick-up trucks are two times as likely to be severely injured during a crash than a teen of the same age driving a car. Teenagers driving a pickup are more likely to drive aggressively and sustain serious injuries in a crash, according to the study which also found that when it comes to aggressive driving behavior, a 16-17 year old is 368 percent more likely to drive aggressively than those 65 or older, while a teen just a couple of years older is only 195 percent more likely. Full article: Teen Drivers and Pick-up Trucks, A Bad Mix? at ABC News.